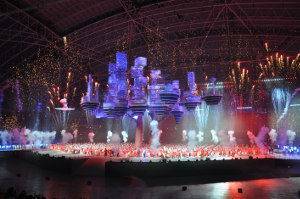 Christie visual solutions delivered spectacular visuals that captivated over 55,000 spectators who attended Singapore’s 51st birthday celebrations at the new National Stadium on August 9, 2016. The stunning projection mapping performances were planned and executed by Christie’s rental staging partner Hexogon Solution Pte Ltd.
A total of 66 Christie Boxer 4K30 3DLP projectors were installed around the 4th level of the stadium to claim the biggest real-time tracking 3D projection mapping show in the world for this National Day Parade (NDP) in Singapore. 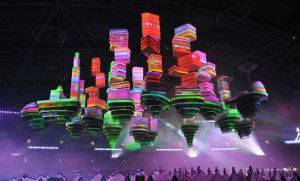 A slew of bright and vibrant visuals projected onto the surfaces of the two moving structures by the Boxer 4K30s greatly enhanced the scale and excitement of the celebrations. This marks the debut of Christie Boxer 4K30s at the National Stadium since the completion of this state-of-the-art sports facility in 2014. Adrian Goh, Group Managing Director, Hexogon Solution, said, “This is the first real-time tracking projection mapping on 3D objects at the NDP. Forty tracking cameras around the entire stadium and 260 tracking beacons were installed onto the boulder and the 3D Sky City, to enable the system to accurately track and map the visuals provided by the committee onto all surface of the structures as the objects move. According to Goh, the challenges faced by his team were the very short time allotted for calibration and alignment, as well as unpredictable on-site conditions. “The Christie Boxer 4K30 is easy to handle and it allows us to spread the projected image without compromising the result. With strong features such as 4K resolution, 30,000 lumens, a significantly smaller footprint and omnidirectional capability, it was a breeze to position the projectors in different angles to cover the whole Sky City structure. “On the other hand, the sheltered environment of the National Stadium is definitely a better location for both equipment and people to work in, as compared to the fully outdoor Marina Bay Floating Platform that was used for staging previous NDPs,” Goh said. Lin Yu, Vice President, Christie Asia Pacific, added, “As one of the most prominent rental stagers in the region, Hexogon Solution is continually improving its capabilities and know-how to deliver spectacular and truly memorable visual experiences.